Hosley's Set of 3 Tea Light Dark Brown Iron Wall Scones: Live, Laugh, and Love. Glass cups included. Sconces measure Small 8.5" x 2.76" x 10", Large 15" x 2.76 x 10". For Tea Light candles only. 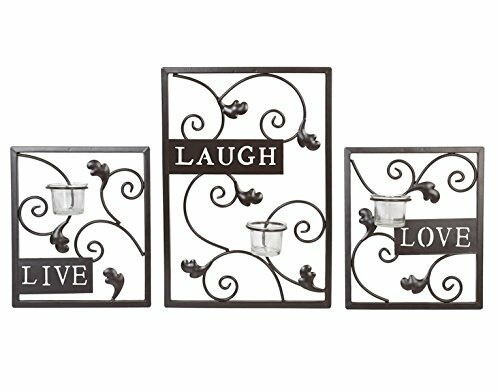 PRODUCT: Hosley's Set of 3 Live, Laugh, Love Wall Sconce with Glass cups Included. BENEFITS: The gorgeous metal leaf pattern tea light candle holder, holds 3 Tea Light candles. Perfect for bedroom mood lighting or a living room wall, it also makes an excellent addition to event furnishings. MEASUREMENTS/MATERIAL: Measurements for each one are: Small 8.5" x 2.76" x 10", Large 15" x 2.76 x 10". and made of Iron.